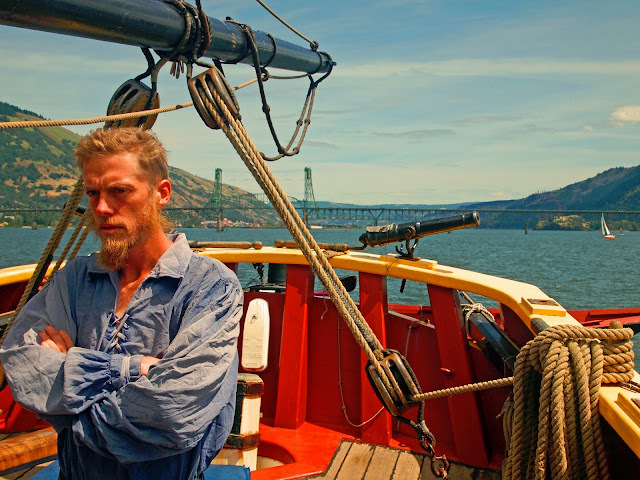 The captain was a stern fellow as he was responsible for his passengers, tight maneuvering, and a river full of barges and various wind junkies playing Chicken with the ship. Sometimes one should believe the hype -- especially when such results in an epic mock battle in a replica square-rigged ship from the 1780s. My buddy at Squidnut Squidknot posted about how Grays Harbor Historical Seaport Authority had two tall ships, the Lady Washington and the Hawaiian Chieftain, sailing up the Columbia River taking landlubbers out for various cruises. When I heard there was a "Battle" cruise I didn't need to hear any other option. For the record, most of the crew were way into "Master and Commander," having not only watched the film several times, but a few of those listening to director Peter Weir's comments. The two ships maneuvered closely around one another, having a day of good current, gusty wind, and a river active with windsurfers and kiteboarders, as well as barge traffic. 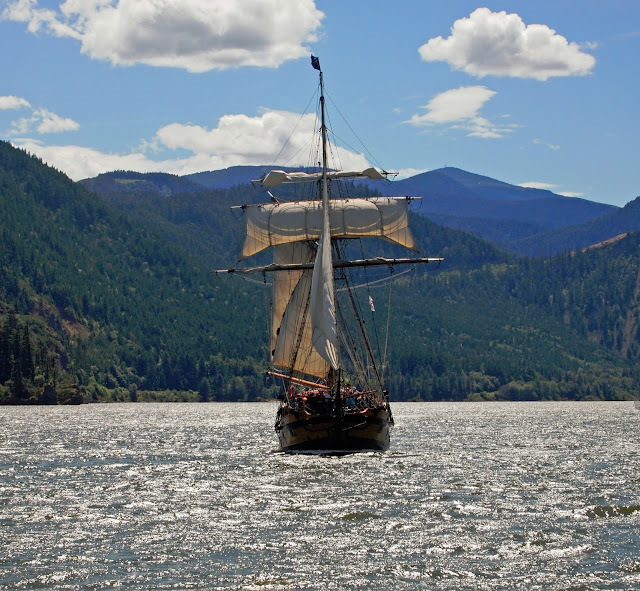 The sun, scenery of the Gorge, two tall ships (pretending) to duke it out, made the day truly special. The Hawaiian Chieftain bearing down on us as Gunner Patty readied her cannon. Will Portdaddia have to endure weeks of your kids talking like pirates?